We would like to welcome you to the Poly Hangers & Supplies web site. We carry all your poly hanging and poly supply needs. Our staff is here to help you in any way that we can. 100% Customer Satisfaction is our number one priority. So if you are unsure of what product is best for your project call us toll free at 1-800-227-8479. What Kind Of Products Does Poly Hangers & Supplies Provide? What are the benefits of using poly hangers? Poly Hangers securely attach poly sheeting to building surfaces to allow fast construction of dust barriers, containments, leak diverters and other temporary protection systems. They are simple to install, remove, and reuse on the next job. They also increase productivity, eliminates damage of building surfaces and prevents poly sheeting from falling down. What are the benefits of using poly barrier dust walls? 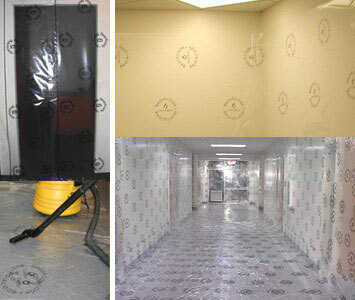 These systems were a result of a long search for a way to put up a dust containment barrier quickly, without using tape, nails or other materials that are slow and damaging to walls and ceiling. The walls create extra tight seals without the hassle of using using tape, staples, furring strips or ladders or spray glue. Most barrier units can be assembled and ready to work in under 5 minutes. These poly dust barriers are used worldwide in hospitals, museums, airports, industrial clean-rooms, residential homes, offices, etc. What are the benefits of using Bearacade stick poly™ self adhering poly vs the conventional method of using poly with spray glue and duct tape? 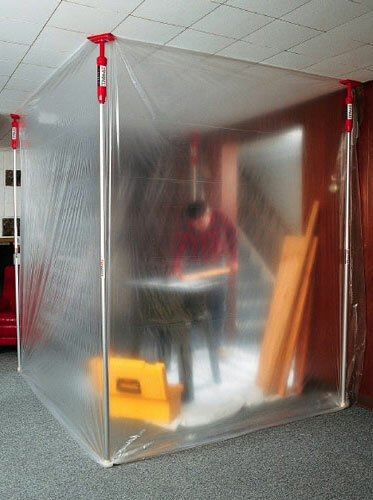 The goal of creating containments is to isolate the workspace from the outside environment, allowing for the control and removal of harmful materials such as asbestos and mold. To achieve this goal, the containment must have the ability to create and maintain a sealed environment for the time to complete the work. 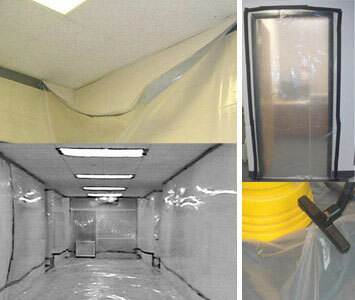 Current containments made from duct tape and visqueen type plastic poly films have failed to meet this requirement. They fail because the duct taped plastic releases from the wall, reducing or eliminating the negative pressure within the containment. This creates the potential for particle release outside of the containment. 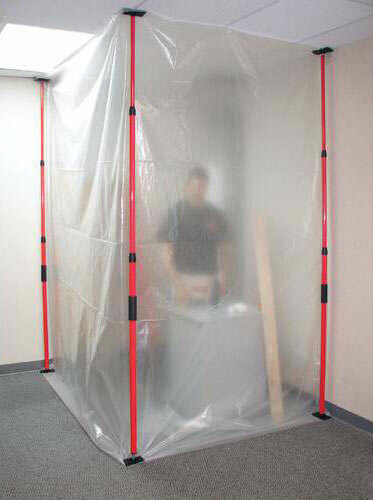 Walls and floors, under negative pressure, "billow out or up to distances of 2-3 feet creating loss of visual space. Workers must be careful to avoid cutting or tearing the "billowed film with tools and equipment. The two layers of floor film not only "billow, but are slippery. This can cause tripping and other safety concerns. Insurance rates reflect many of these hazards of building containments with the current method using duct tape and poly film. The BearAcade sticky poly™ self adhering poly are dedicated to improving the abatement of noxious materials by bringing new technology and methods that result in improved isolation containments. A new way of building containments has been developed to address both the quality and lower overall costs. New materials consisting of adhesives that are removable but have the holding power to provide containments that will not fail, and methods of building containments, including applicators that can deliver ten times the average square foot per man hour have been developed. This new system, "The BearAcade™ Way has provided some contractors the ability to double their business and deliver improved containments to their customers. "The BearAcade™ Way was developed and tested by abatement contractors to insure real world performance on the job. Why Choose BearAcade sticky poly™ self adhering poly? • Hand or machine application; machine application results in a 10 fold increase in the average square feet per hour; significant increase (2 fold) in the average number of criticals per hour. • Contractors reduce overall costs, improving profits, and competitiveness to win more contracts. • Does not fall from walls - stays up until the job is finished. No time lost reapplying a failed containment. • Superior holding power. 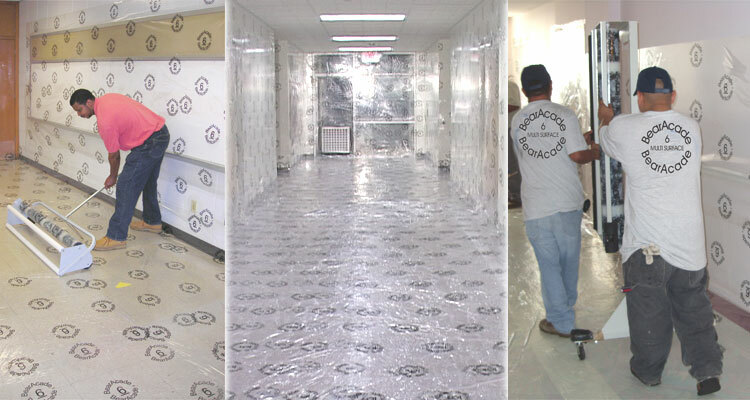 BearAcade films are fully coated with an adhesive designed for abatement conditions. 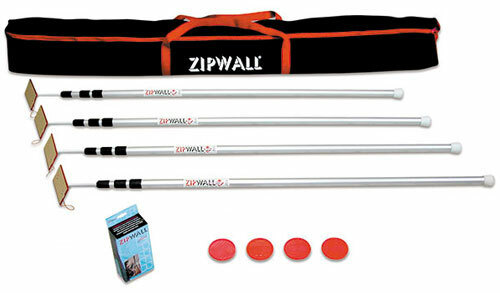 Holds two times the negative pressure requirements for removal of asbestos. 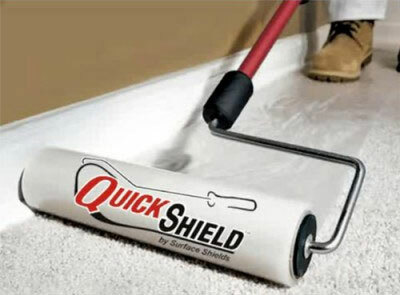 • Eliminate "billowing" from wall and floors. Improves vision within the containment, eliminates accidental snagging of the billowing film with tools or equipment, and floors are less slippery than billowed floors. • Improves clean up and vacuuming. Floor layers are bonded to each other resulting in a surface that is easily cleaned. 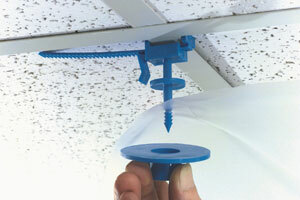 • Eliminates the need for spray adhesive primers during installation. • No clean up of adhesive residue prior to repainting. • Reduces damage to painted wallboard surfaces, reducing prep work prior to repainting. • Superior seal quality of the overall containment. Fully coated sheets result in improved seal over the total containment. Conformance to asbestos abatement regulations. • The BearAcade sticky poly™ self adhering poly sheeting were developed and tested by abatement contractors to insure real world performance.